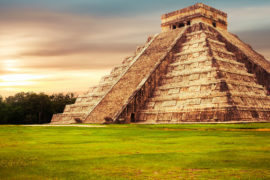 This private tour is great to learn all about the Riviera Maya! Dates: June: 1 – 8 and August: 24 – 31. Language: English, Spanish, German and French. We have proffesional guides who can teach you everthing about mexico´s beautiful fauna and flora. During this trip, the guide provides you with interesting facts and show you the most beautiful places. In this amazing Transformative Journey you will get to help and snorkel with Marine Turtles, go on a boat trip, swim with the biggest fish in the world, learn about jaguars and many more. Explore 3 different ecosystems: Jungle, Reefs and Wetlands. Be part of conservation projects with Marine Turtles, Jaguars and Whale Sharks. Get to see amazing wildlife: Whale sharks, Marine Turtles, Jaguars, Birds, Snakes, Bats, Crocodiles and much more! Arrival to Cancun and private transfer to Tulum. Participate in the National Mexican sea turtle conservation program. You will spend the night in Tulum. Early bird watching to discover the amazing variety of birds of the Yucatan Peninsula. Afterwards you go Visit the unique Sian Ka’an Biosphere Reserve, the largest protected area in the Mexican Caribbean that belongs to the UNESCO World Heritage Site. Moreover you go travel to the Mayan jungle south of Cancun (Caobas), with the biggest population of Jaguars in Latin-America. Then, in the evening there is a meeting about jaguar research in Calakmul. The night you will spend in Calakmul or near. These days you will be in the jungle searching for jaguars, doing research, learning and doing conservation work with the main researcher of Jaguars in Mexico, Gerardo Ceballos. You will stay the night in Caobas or near. Morning departure to Bacalar to enjoy a boat trip to see the oldest living organisms in the world (Stromatolites). Followed up by going to Kantemo Maya community to witness a true amazing hunting experience by snakes. They hang from the ceiling as a strategy to hunt on bats that come out of the cave every night. You will stay the night in Carillo Puerto. Swim with sea turtles in the second largest coral reef in the world. You will stay the night in Puerto Morelos. Swim with the biggest fish in the world, the Whale Shark, and then get to relax and eat delicious ceviche in Playa Norte, one of the most beautiful beaches in the world. Private departure to Cancun airport for your flight back home. Want to book this tour with more than 2 persons? Please contact us for special group prices!